22.00 Revontuli ceremonial firedance ritual!! write all your dreams on paper and bring em to us. we will sacrifice them to fire goddess and make all your dreams come true!!! by registering their birthday all other that are celebrating it here can get in for free!! 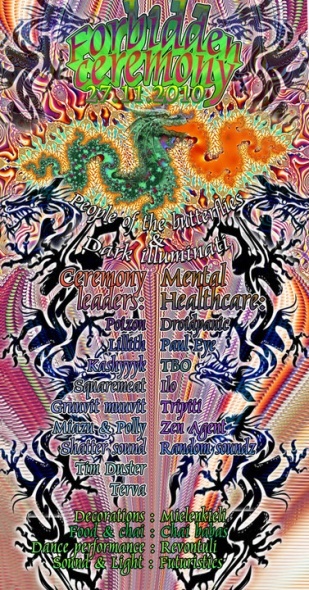 People of the butterflies join forces with Dark illminati to bring you this unique event. Forbidden ceremony is magical dance experience that will lead you deep state of trance. Futuristics and Mielenkieli will be the ones to take care of your audiovisualistic experience with mind blowing lights, videos and decoration.